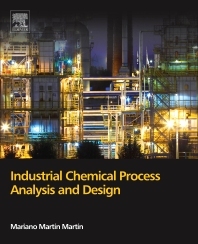 Industrial Chemical Process Analysis and Design uses chemical engineering principles to explain the transformation of basic raw materials into major chemical products. The book discusses traditional processes to create products like nitric acid, sulphuric acid, ammonia, and methanol, as well as more novel products like bioethanol and biodiesel. Historical perspectives show how current chemical processes have developed over years or even decades to improve their yields, from the discovery of the chemical reaction or physico-chemical principle to the industrial process needed to yield commercial quantities. Starting with an introduction to process design, optimization, and safety, Martin then provides stand-alone chapters—in a case study fashion—for commercially important chemical production processes. Computational software tools like MATLAB®, Excel, and Chemcad are used throughout to aid process analysis. 8.1.-Biomass types to fuels and energy: Grain, Lignocellulosic biomass, seeds, algae. Dr. Mariano Martín is currently Assistant Professor of Chemical Engineering at the University of Salamanca, and certified as Associate Professor by the Spanish Quality agency. Dr. Martín received his BSc and MSc in Chemical Engineering at the University of Salamanca in 2003 where his final degree project received the Accesit Mapfre Award. He obtained a FPU Predoctoral Fellowship from the Ministry of Science,Spain, to develop further understanding on the mass transfer mechanisms from bubbles in gas – liquid contact equipment. He graduated in 2008 with honors and was recipient of the Outstanding PhD award from the University of Salamanca. Dr. Martín joined Procter and Gamble, Newcastle Technical Centre, for a postdoctoral appointment at Modeling and Simulation dealing with complex chemical reactors. For this work Dr. Martín received the P&G award for his contributions to modeling and simulation within P&G. After more than a year he decided to accept a Fulbright postdoctoral position at Carnegie Mellon University to work on the design of optimal biofuel production processes under the supervision of Prof. Grossmann. Almost two years later a position was opened at the level of Assistant Professor at his Hometown University of Salamanca which he holds today. Dr. Martín acts as International Mobility Coordinator for the Chemical Engineering degree and Head of the Master Studies in Chemical Engineering. Dr. Martin is Subject Editor of Latin American Applied Research, Journal of Advanced Chemical Engineering, Frontiers in Energy and Process Engineering and Energy Research Journal in addition to serving as referee of numerous chemical engineering journals and evaluator of national and international research proposals. His research field lies in the topic of bioprocesses modeling, simulation and optimization. As a result of his research, Prof. Martín is co-author of 55 papers in peer reviewed international Journals and 16 book chapters. He has also presented 51 papers in international conferences, given seminars and workshops at industrial and academic institutions worldwide, prepared international teaching material (CACHE design case studies ) and edited “Introduction to software for Chemical Engineers”. He has been visiting Professor at the University of Leeds, University of Birmingham in the UK, University of Maribor (Slovenia), and University of Concepción (Chile). He has co-advised an honors degree project at CMU, which received two awards, and advised on five final degree projects at the University of Salamanca and 25 MSc in USAL, of which four were awarded TCUE fellowships. This book is useful, I learnt so much with all those examples and exercises.